The Mountain Rides Transportation Authority on Wednesday declined to approve a contract with a local architectural firm for design of a proposed Ketchum Transportation Hub that would serve as a transfer point for Mountain Rides bus routes in the Ketchum and Sun Valley areas. At a special meeting, board members discussed a proposed contract with the Ketchum firm of Eggers Associates and decided there were several clauses that need further clarification or fine tuning. A particular point raised by the board was how the city of Ketchum will fit into the agreement. Mountain Rides Executive Director Jason Miller said the most likely relationship will be that Mountain Rides will be the only client of Eggers Associates and that Mountain Rides will enter into a separate agreement regarding the hub with the city of Ketchum. The city of Ketchum has partnered with Mountain Rides on the proposed hub for the past two years while the hub has been in the planning stages. On Monday, the Ketchum City Council approved allocating $19,620 for design and engineering of the facility. The total cost of design and engineering was earlier estimated at $90,000. The proposed contract, negotiated between Egger Associates owner Kurt Eggers, Miller and Ketchum Director of Economic and Community Development Lisa Horowitz is slightly higher at $90,975. Total cost of the hub, including design and engineering, has been estimated by Mountain Rides at $437,000, with about 70 percent of that amount coming from grants from the Federal Transportation Authority. The proposed hub would be built on both sides of the intersection of Sun Valley Road and East Avenue. 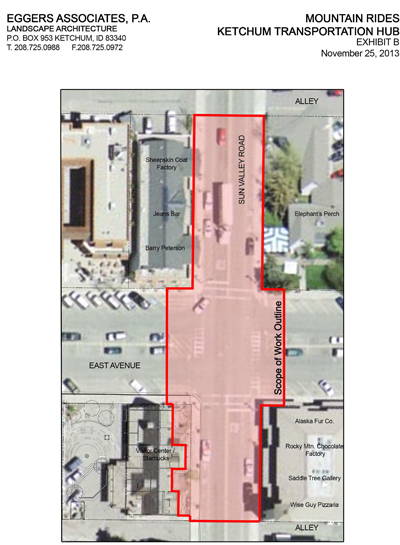 A conceptual design provides parking for up to five buses, sidewalk extensions at all four corners of the intersection to facilitate pedestrian traffic, and islands in the middle of East Avenue for bicycle parking or public art. The hub would serve as a transfer point for Mountain Rides’ five bus routes that run through the Ketchum and Sun Valley areas. In addition to city of Ketchum’s role in the contractual agreement, Mountain Rides board members at Wednesday’s meeting pointed out several areas of the contract that needed clarification, including Eggers Associates’ role as construction manager, the bidding process for a construction contract and responsibility for the performance of subcontractors. Board members preferred that contract language be clarified so that Eggers Associates would manage construction rather than just inspect the work. It was also determined that Eggers Associates be responsible for the performance of subcontractors for design and engineering. Regarding the construction bidding process, Miller said Eggers Associates would issue the proposal for bids but that Mountain Rides would have responsibility for choosing the winning bidder. Mountain Rides intends that construction start this coming summer. Miller said construction may be started in the early summer but suspended during peak tourist times in July and August and be resumed in September and October. Mountain Rides attorney Michael Pogue, who attended the meeting, said a new contract, incorporating suggestions made by the board, can probably be prepared within a few days.